Getting tattoos to commemorate significant events or moments in your life is fairly common these days. On the other hand, even you’re not commemorating anything, getting a tattoo of a piece of art or a phrase that means somethings to the individual is – usually – done so in a positive light. Tattoos can act as symbols of where you’re from, where you’re going, as a permanent reminder of something close to you, or a motivational device to help to focus on your personal goals. Then again, some tattoos happen thanks to drunken holiday mistakes – a small reminder of that blurry weekend in Magaluf where you knocked back so many shots you couldn’t find your hostel and slept on what you thought was the beach but was actually a local’s back garden instead. Ah, good times. Every so often a tattoo comes along – and thanks to the wonderful world of social media, more people can witness it – which stops you in your tracks, and you think, really? Is this real? Is this the age we are living in? Well it seems so. And if this tattoo is real, then 2019 is off to a shaky start to say the least. You see, the tattoo-ee has decided to ink himself with a permanent reminder of the time (or times) he lied to – and cheated on – his wife. The lettering is not the usual font you see for a tattoo, more Comic Sans than the usual calligraphy. And the spelling leaves a lot to be desired. I, Jose L. Torres am getting a tattoo voluntarily on January 2, 2019 so that I can earn my wife’s trust back for the pain and suffering I have caused in our marriage. I feel like, as well as missing out a letter on that last one, the tattoo artist may have missed out a word, too. It would read ‘I am a: Dishonest and disrespectul’. A disrespectul what? We need a proper noun after those adjectives! Typos all over the shop. And though I’m sure no one thought the tattoo artist would come up with this list of interesting attributes, it does raise the question of who did write the list – was it the tattoo-ee? 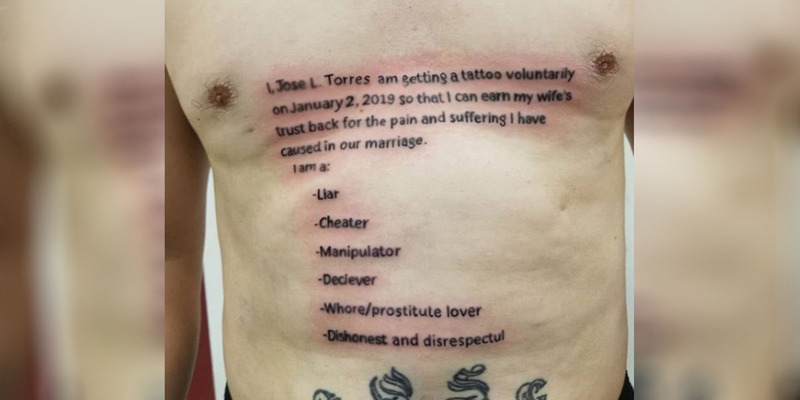 Did he decide to write out this list in the hopes that his admission of guilt, permanently inked on his torso, would be enough to win his wife back? Or was it the wife who wrote out this list? Presumably saying – if you get this tattoo I’ll take you back…? If so, I hope she subsequently makes him wear a vest at all times – this tattoo is not something you want to read, or even look at, everyday. Nothing like some nice lettering to start the year.